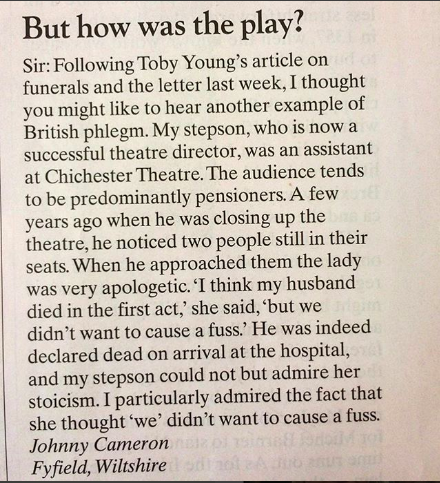 Sir: Following Toby Young’s article on funerals and the letter last week, I thought you might like to hear another example of British phlegm. My stepson, who is now a successful theatre director, was an assistant at Chichester Theatre. The audience tends to be predominantly pensioners. A few years ago when he was closing up the theatre, he noticed two people still in their seats. When he approached them the lady was very apologetic. ‘I think my husband died in the first act,’ she said, ‘but we didn’t want to cause a fuss.’ He was indeed declared dead on arrival at the hospital, and my stepson could not but admire her stoicism. I particularly admired the fact that she thought ‘we’ didn’t want to cause a fuss. Sir – I read with interest [in your review of Dan Jones’ book about King John] the views of Richard of Devizes following a visit to London in the 12th century. Apparently it was full of “actors, jesters, smooth-skinned lads, Moors, flatterers, pretty boys, effeminates, singing and dancing girls, quacks, beggars and buffoons”. I visited London last week …..
You out there, Mr Cameron?